I first met Chester and Harold as a kid and fell in love with them. If you haven’t encountered these two yet, let me introduce you. Chester is a highly educated cat with a vivid imagination. One of his delights is to listen to his owner, a college English professor, practice class lectures. He’s widely read, and especially favors Edgar Allen Poe. Harold isn’t quite as intellectual as Chester, but he does have a good deal more common sense. He’s also the one who wrote and delivered the first manuscript of this story. Mr. Howe confesses to being only the publisher. In this first installment of Chester and Harold’s adventures, a baby bunny comes to live with the Monroe family But he’s found at a Dracula movie, he has strange markings and oddly pointed teeth, and the note found in his basket is an obscure dialect of the Carpathian mountain region (fortunately, Harold is familiar with the language due to his varied ancestry), which is to say, Transylvania. When a variety of vegetables show up with tiny teeth marks and all juice and color drained from them, Chester puts two and two together and turns to his copy of The Mark of the Vampire. The lengths he goes to to protect his family from this imagined threat nearly get him tossed out of the house and left my boys and I howling with laughter! James Howe has written several related stories. They haven’t received the same acclaim as Bunnicula, but I own Howliday Inn, and I love it almost as much. I have not read the others, but I’ll be reviewing some of them soon. Previous Indie Endeavors, Part 7: Why Publish ebooks on Smashwords? A classic! Thanks for the visit! Great review, Michelle. The book sounds really fun! Thanks. Hiya, Tim! Yeah, this one is short and hilarious. My kids have read this one, but I never have. It does sound fun! Hi Coreena. I think this one’s been pretty common in fourth grade curricula, at least in the states. A real kid-pleaser. Celery Stalks at Midnight is the most hilarious title. My daughter read these books a couple years ago and loved them. Hi Kristin. Thanks for stopping by. I haven’t read that one yet, but if it’s anything like this one, the title’s just the beginning. I’m going make a point this summer to finish this series. I’m not familiar with this book or the author — although my maiden name was Howe. What am unlikely group of characters. Your review was excellent. The fact the you and your boys were howling with laughter, is a good sign. I like funny. Hi Patricia. This was a husband/wife duo, and a great one. Unfortunately, Deborah died shortly after publication, and James carried the series alone. Great review! 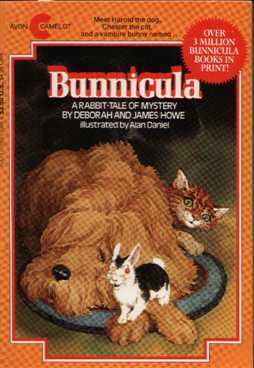 I’ve seen Bunnicula before, but didn’t pick it up because it didn’t seem interesting at all because I’m not fond of vampire things. I’ll try it, now that you’ve recommended it (and I DO LIKE FUNNY)!!! I don’t like vampires either, but this one’s just fun – like when Chester tries to destroy the vampire bunny with a steak (think beef)! I’m with you on the much love for the wit and humour of BUNNICULA! Fantastic series indeed. Hi Deb. Thanks for stopping by. Slowly, I hope to get to know all the MMGM posters (I visited your blog briefly) a little better. Thanks, Caroline. That sounds awesome!